Dr. Edward E. David, Jr. was Science Advisor to President Nixon and Director of the White House Office of Science and Technology from 1970 to 1973. In 1993 he sold a large portion of his "first collection" to the Houston Museum of Natural Science, where it forms the core of a major hall. He then began building yet another major collection - his "second collection," which he also sold in recent years. The specimens on this page are from his second collection. Although in his eighties, Dr. David, as you would expect, is now building yet another collection. I have always admired Dr. David's eye for aesthetics and I am happy to present some of the fine specimens from his second collection. And, there will be more from his collection in a future update. 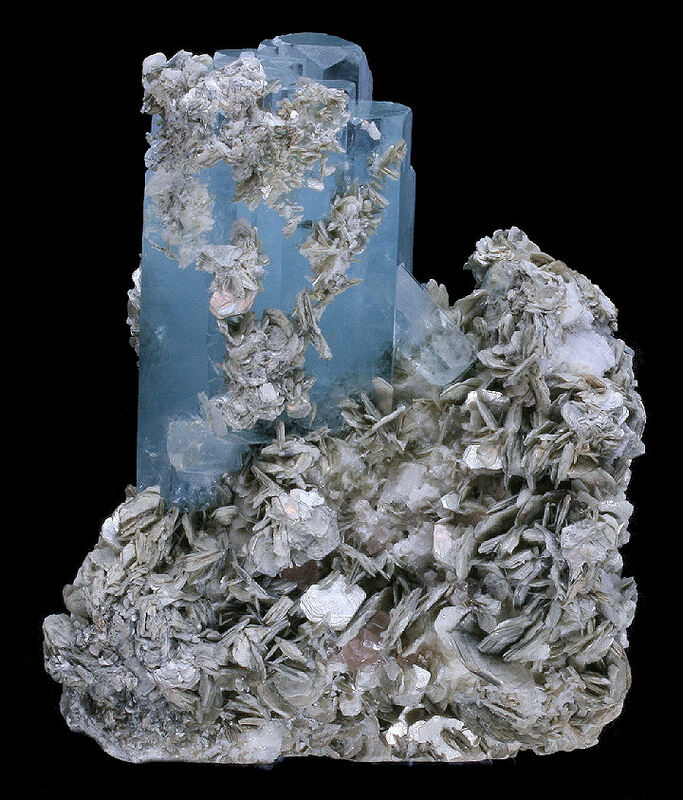 A large crystal of Microcline var. 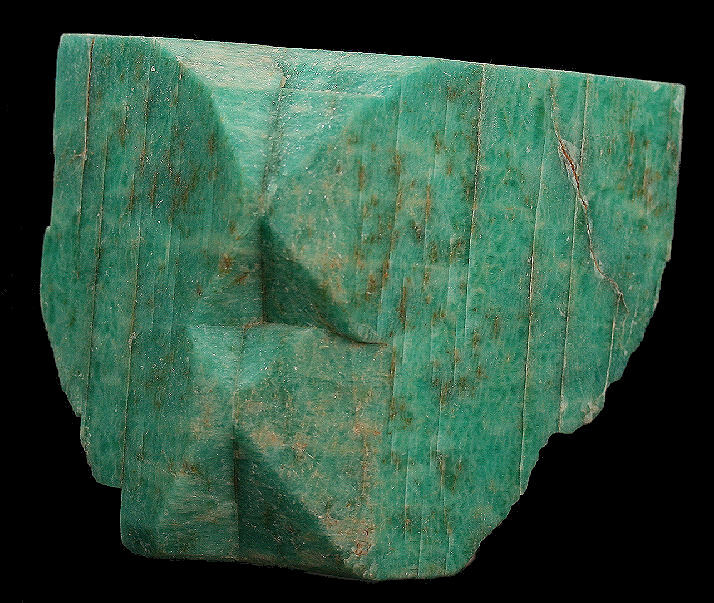 Amazonite showing distinct twinning planes. 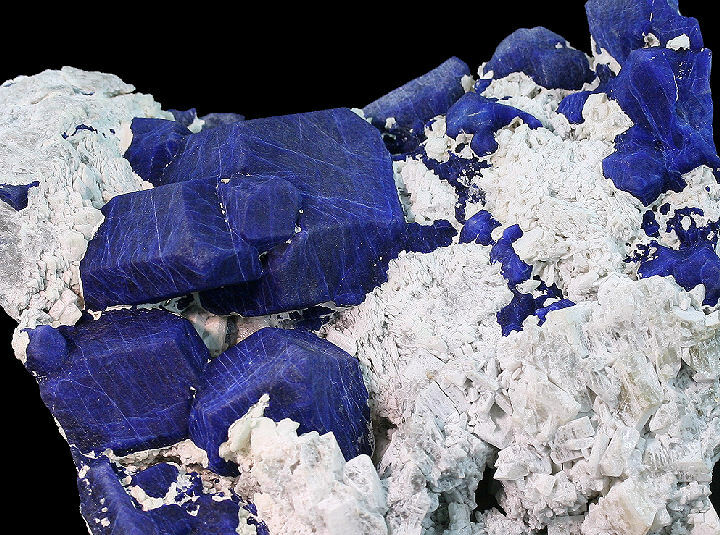 Beautiful, well formed, complex crystals of rich blue Lazurite on Calcite matrix. excellent condition. You want find many fine large plates like this one from Dr. Edward David's collection. 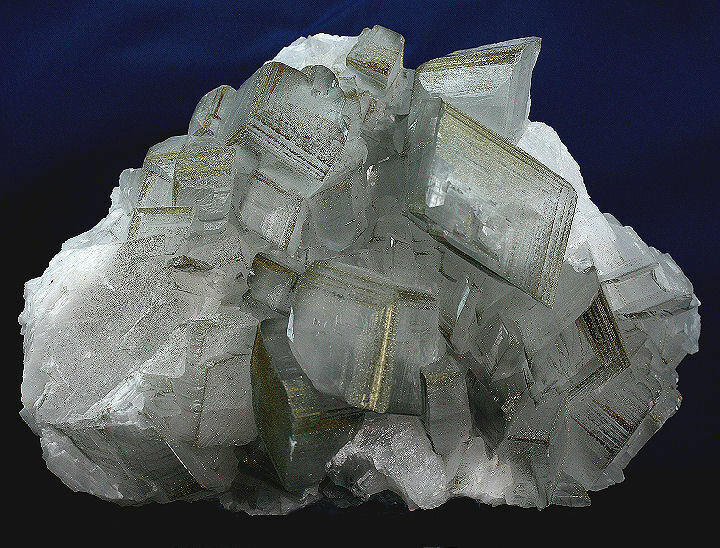 The largest crystal measures 4 x 3.5 cm. 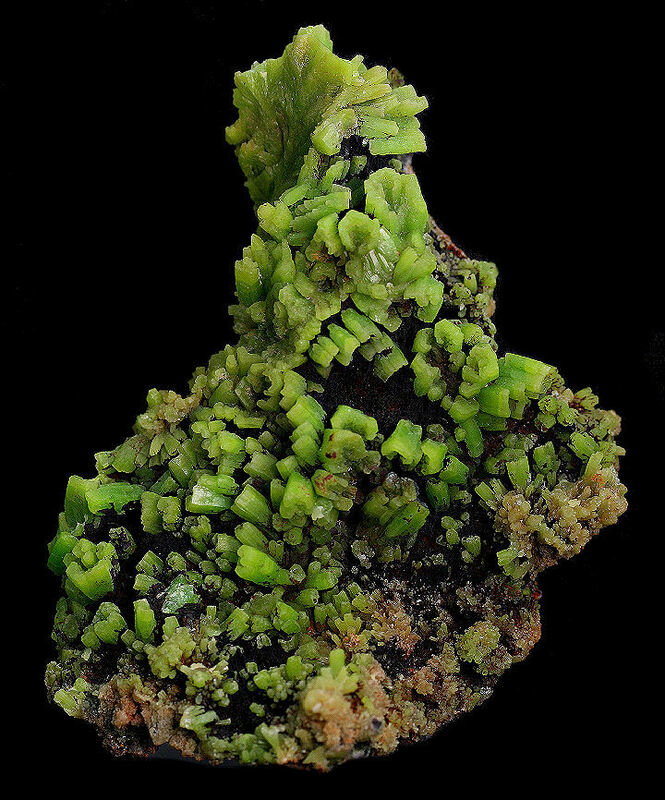 A large plate of numerous lustrous, grass green Pyromorphite crystals covering a nicely contrasting black matrix. In excellent condition. Gemmy, light blue, hexagonal Aquamarine crystals to 2 x 2.5 cm on silvery Muscovite matrix with a nicely accenting pink Apatite crystal. No significant damage. 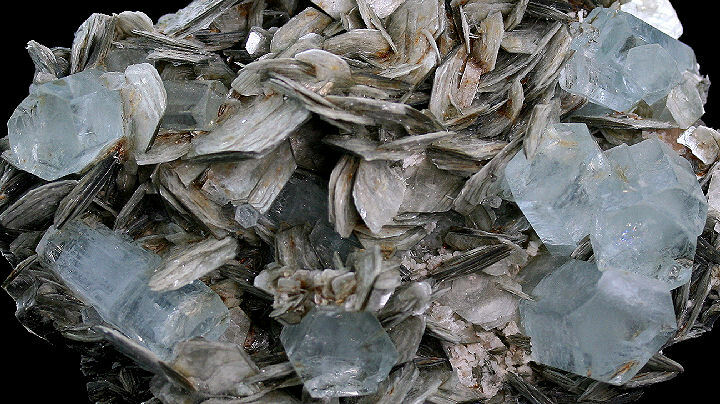 Absolutely stunning coverage of gemmy, double terminated Fluorapophyllite crystals with some white Stilbite on a Choral (fine Quartz) covered matrix. In super condition. This one ranks on the upper echelon of Indian specimens. 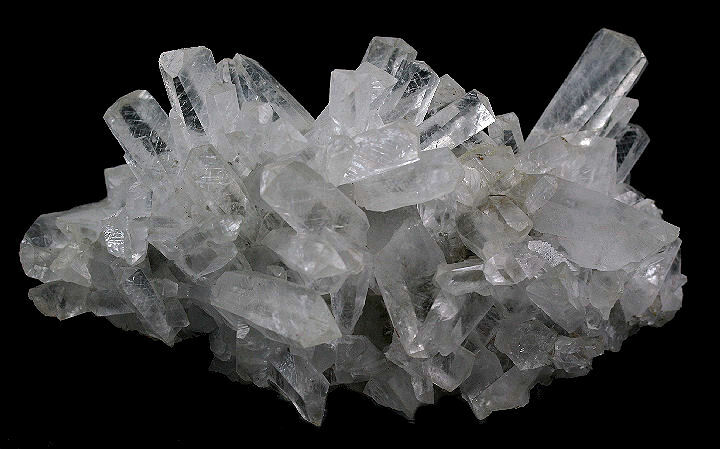 Large cluster of glassy Calcite crystals from the Bigrigg Mine in England. 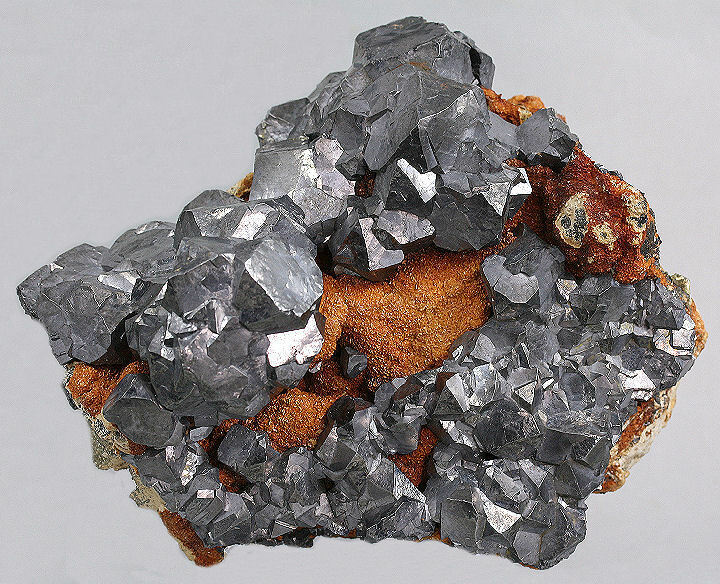 Well crystallized, silvery Galena on matrix from the now closed Turt Mine in Romania. 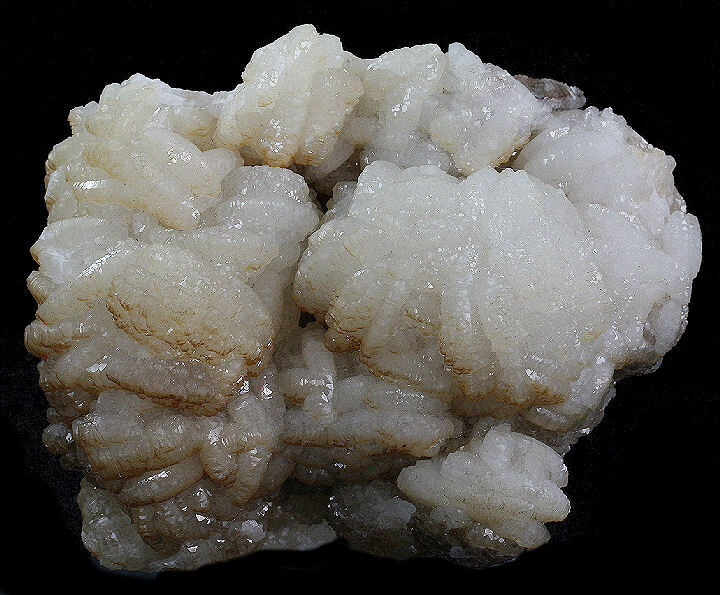 Excellent specimen of Hemimorphite from the Sterling Hill, which was the source for most of the local (New Jersey) Hemimorphite. The bulk of the material was found in the old Passaic and Noble Mines. 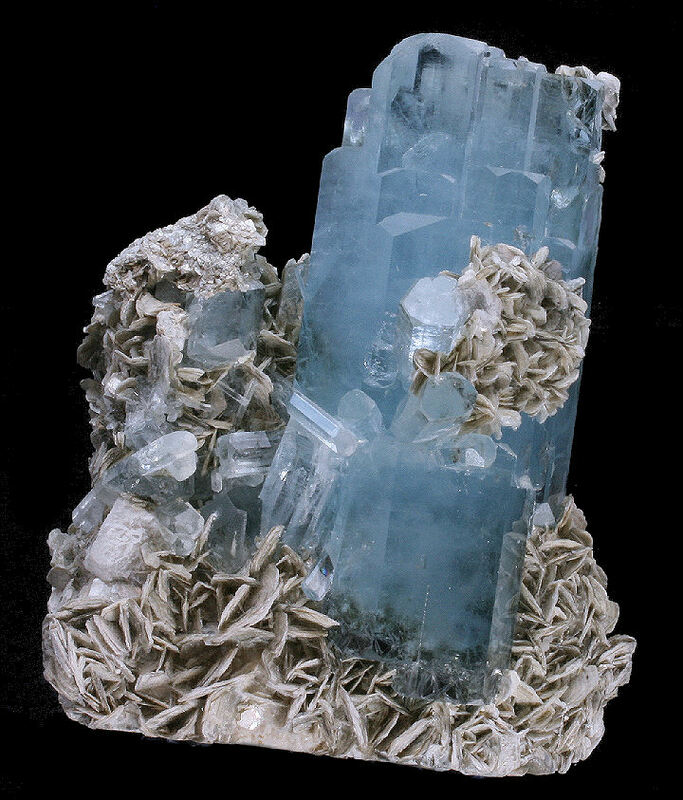 On many specimens the terminations of the Hemimorphite crystals are serrated and closely-spaced. 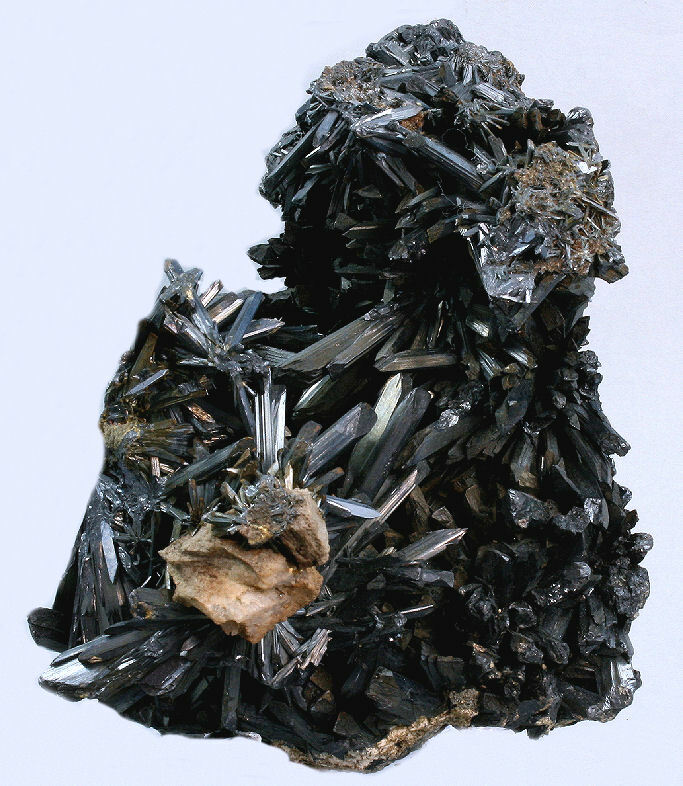 Collectively the crystals resemble aggregates of maggots, from which rose the old miner’s name, "maggot-ore". 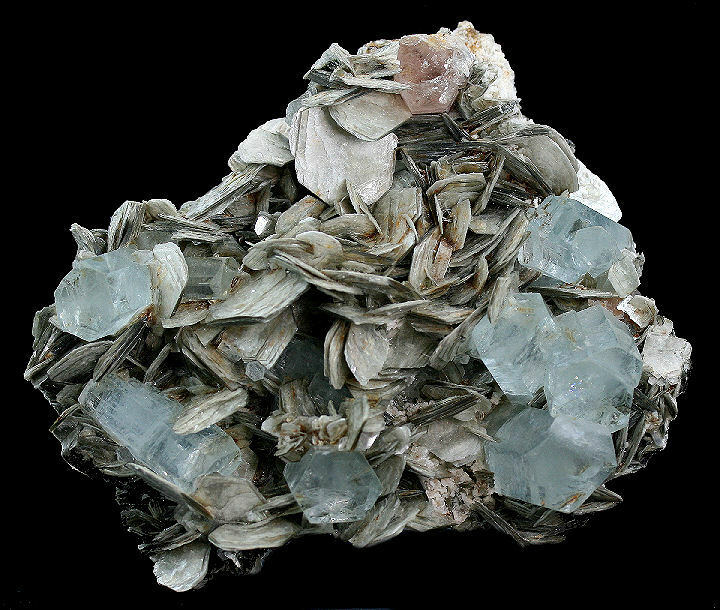 These specimens are among the best Hemimorphite specimens found anywhere and are present in most systematic collections. 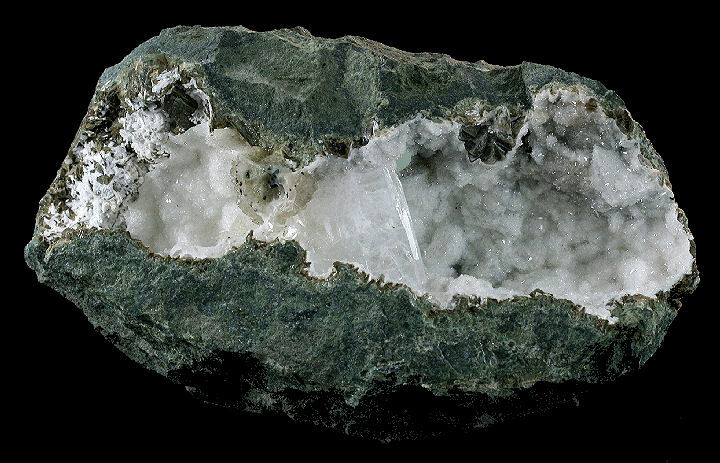 Most are white, lustrous, and very attractive and some have interesting depositional stains. 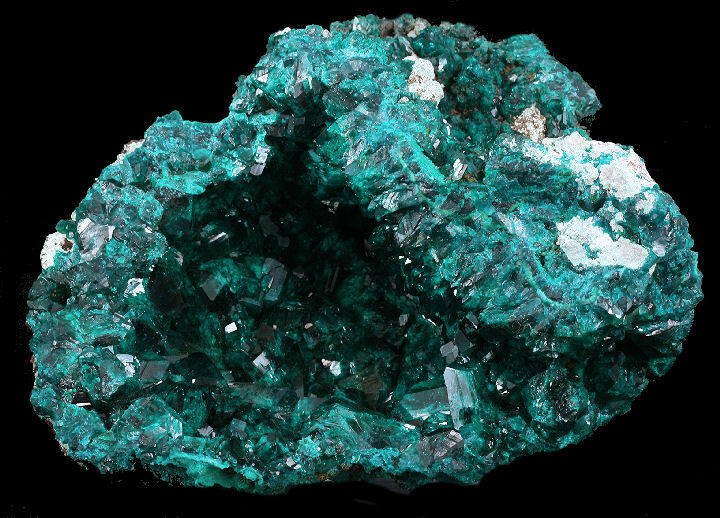 The occurrence was mined extensively in the 1870’s, and Hemimorphite was at that time a chief ore of zinc from Sterling Hill. 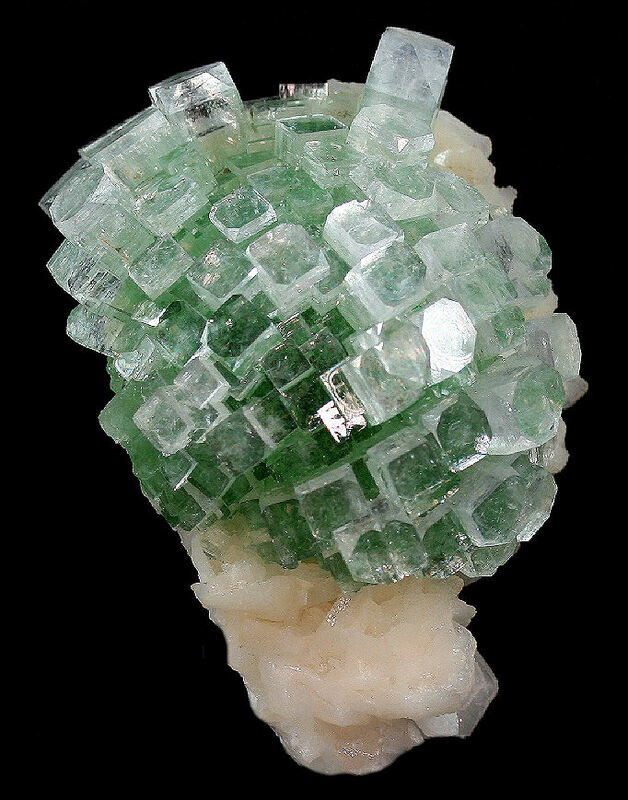 Cluster of white albite crystals heavily coated with a green Chlorite mineral. 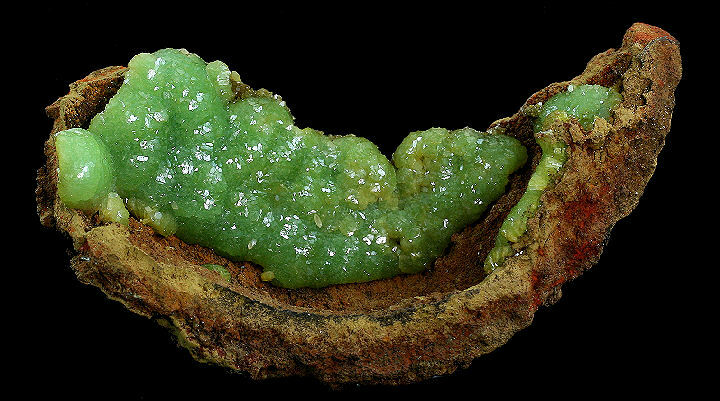 Super specimen of rich green, lustrous Adamite in rare botryoidal form on Limonite. In excellent condition. 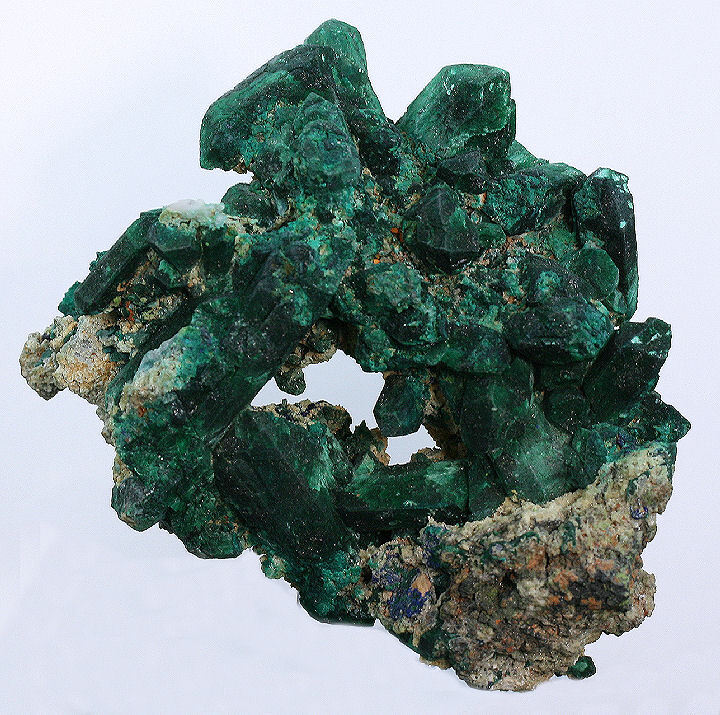 Fine Tsumeb Mine specimen of Malachite that has replaced a complex cluster of Azurite Crystals. 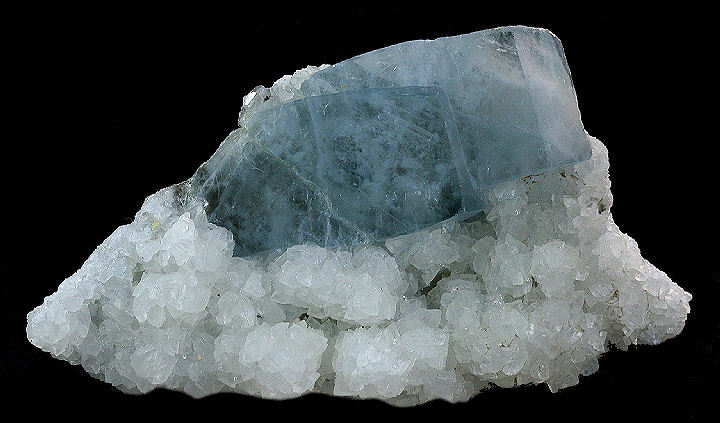 Nice, sky blue, translucent, pair of Celestite crystals on a plate of Calcite crystals. 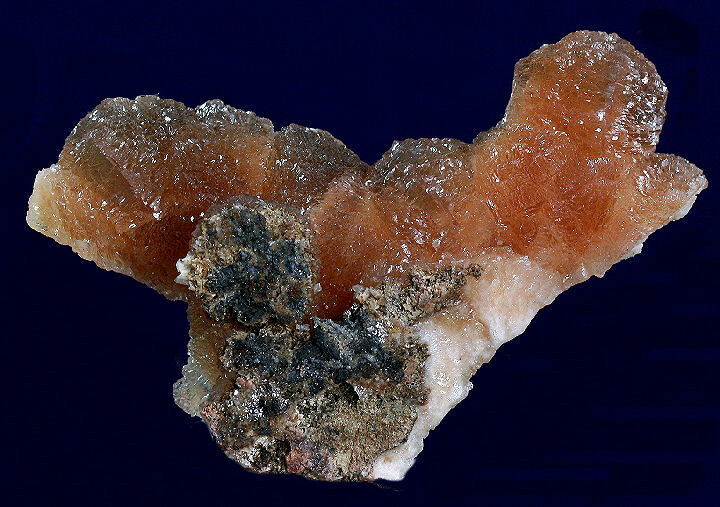 Large twinned crystal of lustrous orange Scheelite with a minor piece of Muscovite. 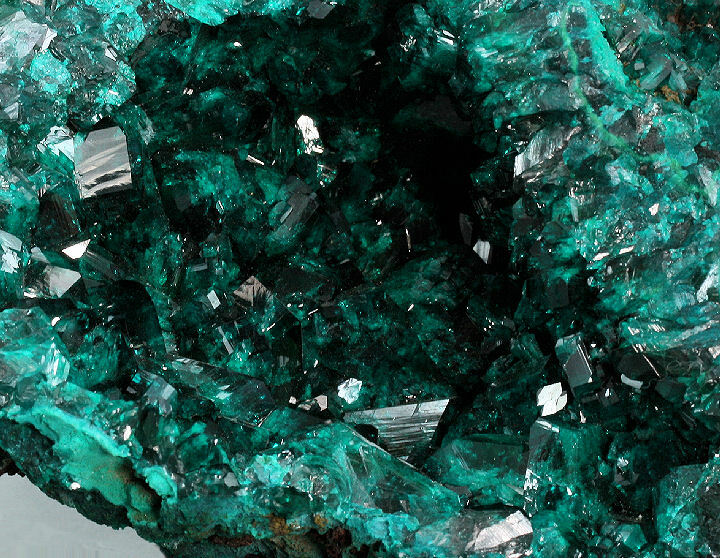 Large Geode of essentially solid Dioptase with it's cavity filled with pristine, super gemmy, Dioptase crystals to 1 cm+. Much, much better in person !! Mass of microcrystals of very lustrous, bright salmon-pink Poldervaartite on matrix from the N 'Chwaning Mine. A very nice example of the sought after "Disco Ball" configuration of cubic Fluorapophyllite crystals perched on a plate of cream colored Stilbite. 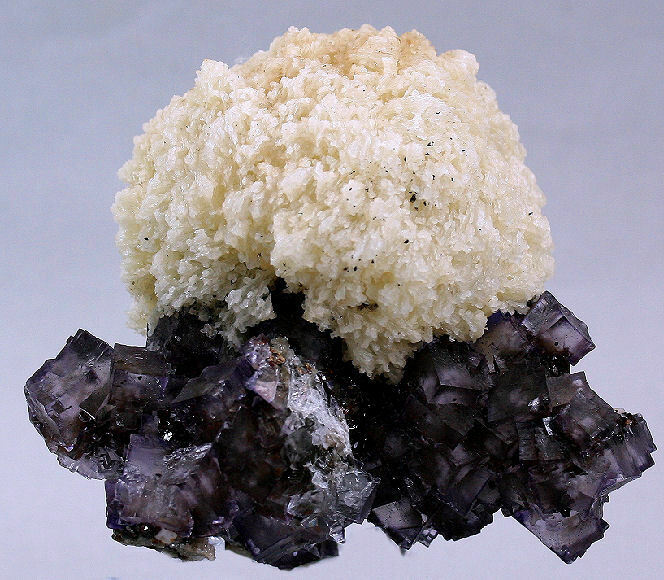 A well formed ball of white Barite crystals perched on a mass of purple Fluorite crystals from the famous Elmwood Mine. 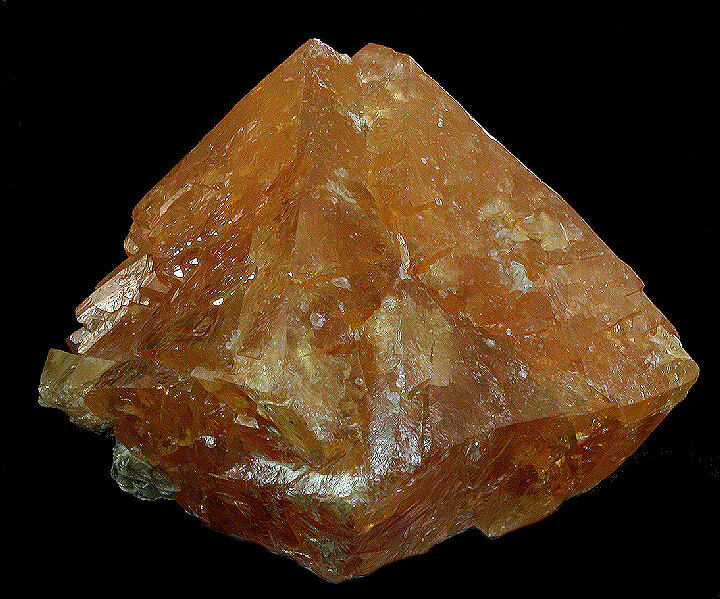 A single 1.75 x 1.5 cm, glassy crystal of Yugawaralite sits in the center of a Quartz lined vug. 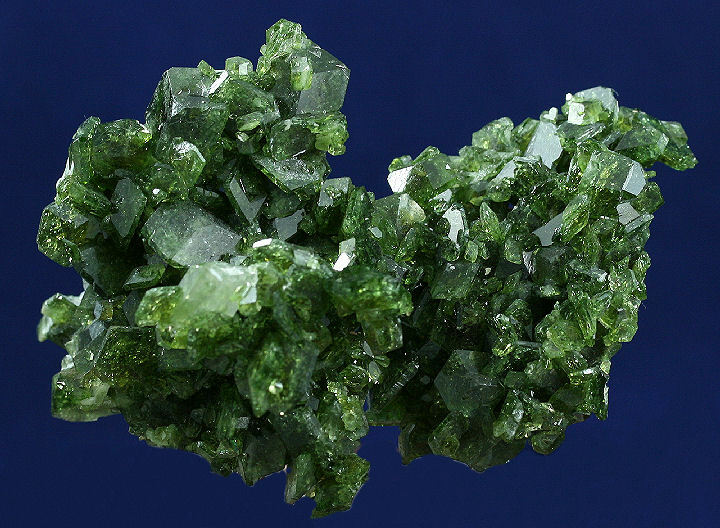 Yugawaralite is an extremely rare member of the Zeolite group of minerals. 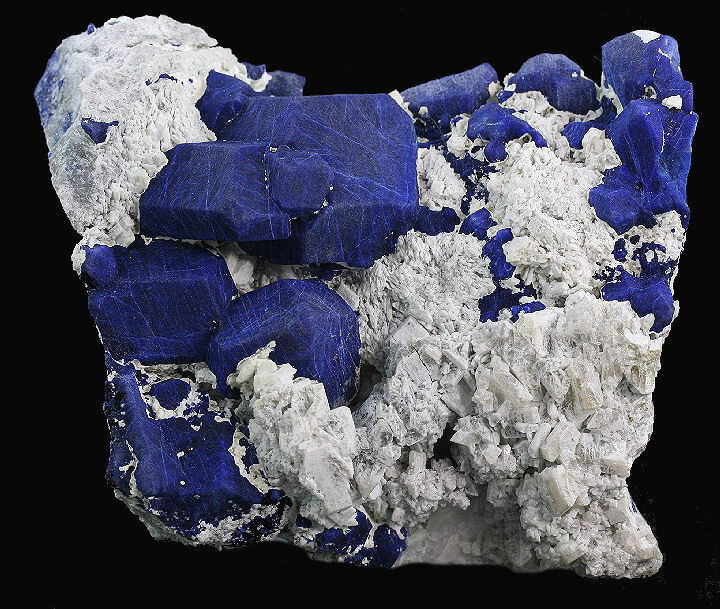 Cluster of Rhodocrosite rhombs (to 1x1.5 cm) from the famous Sweet Home Mine. 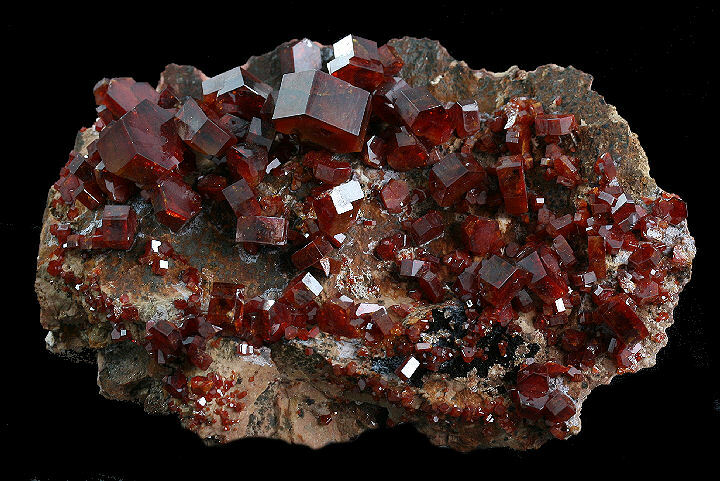 Very nice plate of blood red, hexagonal crystals of Vanadinite on matrix. 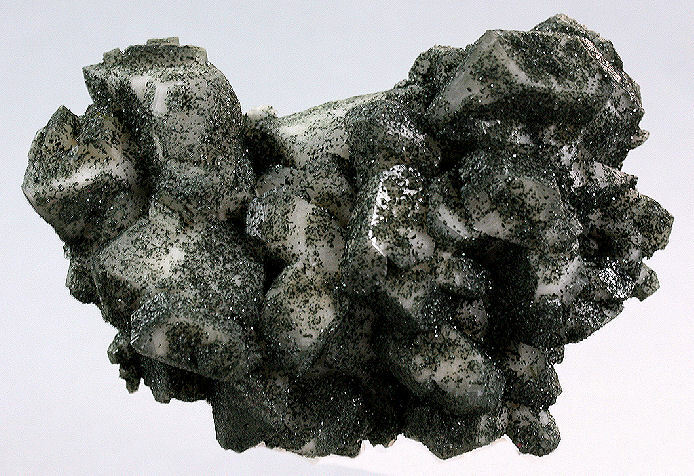 Large plate of Calcite rhombs with edges coated with golden microcrystals of Chalcopyrite. Large cluster of sharp Stibnite crystals from - not China or not Romania, but from Nevada. Manhattan, Nevada Stibnites are considered to be the finest US Stibnites. 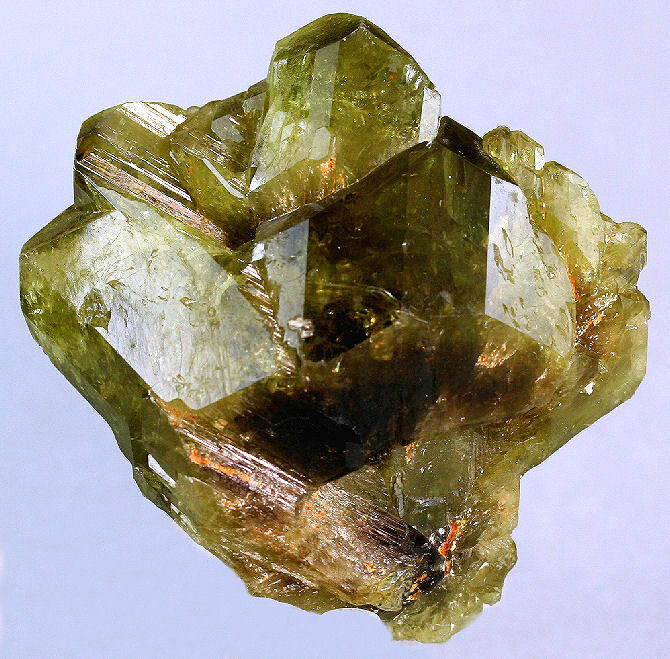 Gemmy, very lustrous cluster of Chrysoberyl crystals. 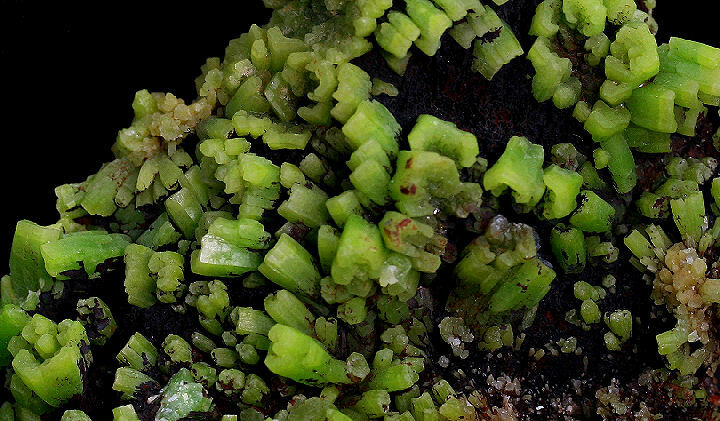 Scheelite was first described in 1821 for an occurrence in Mount Bispbergs klack, Säter, Dalarna, Sweden, and named for Carl Wilhelm Scheele (1742-1786). 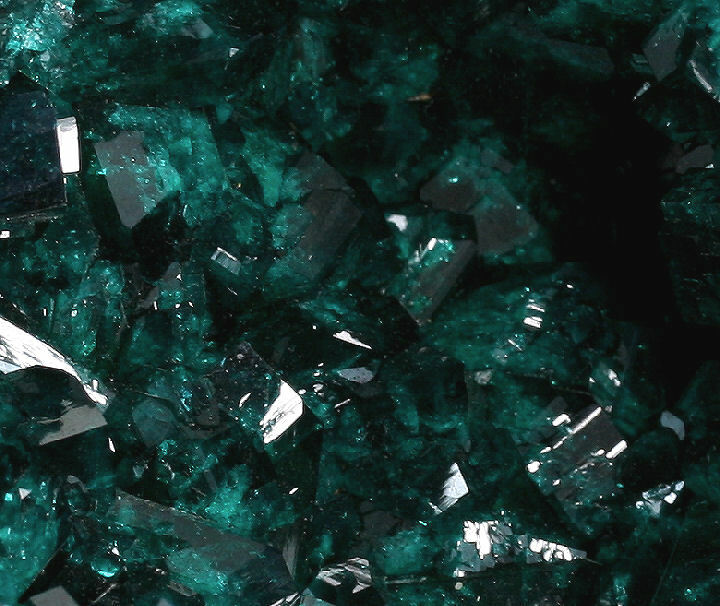 Click here for information on Dioptase. Click here for information on Uvite. 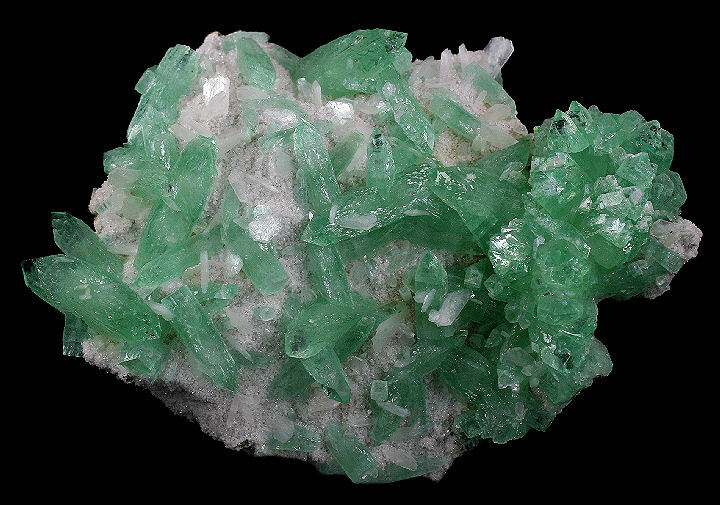 Rich cluster of gemmy, green Uvite Tourmaline crystals with some associated Magnesite crystals. 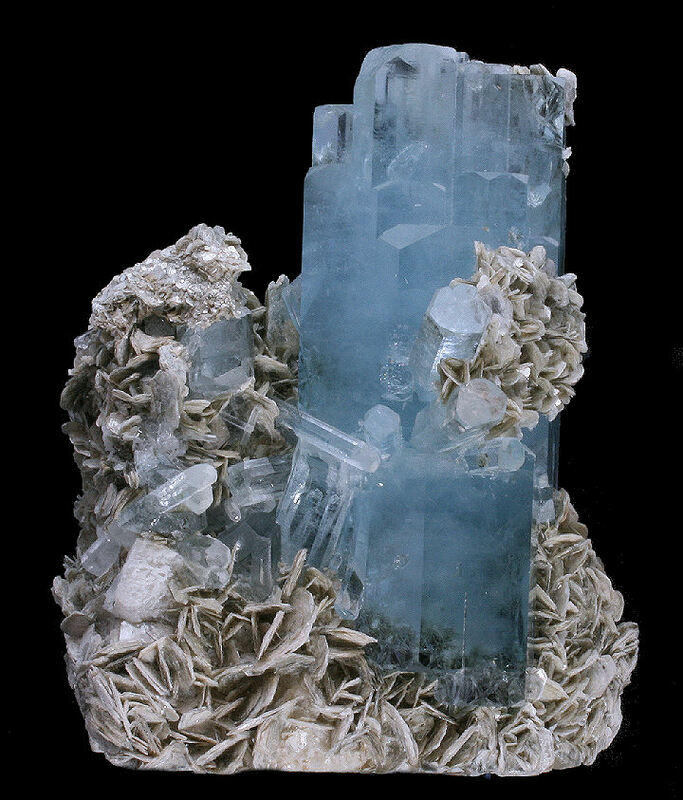 Superb, large doubly terminated light blue crystal (14 x 6.5 cm) on Muscovite with additional smaller Beryl crystals. 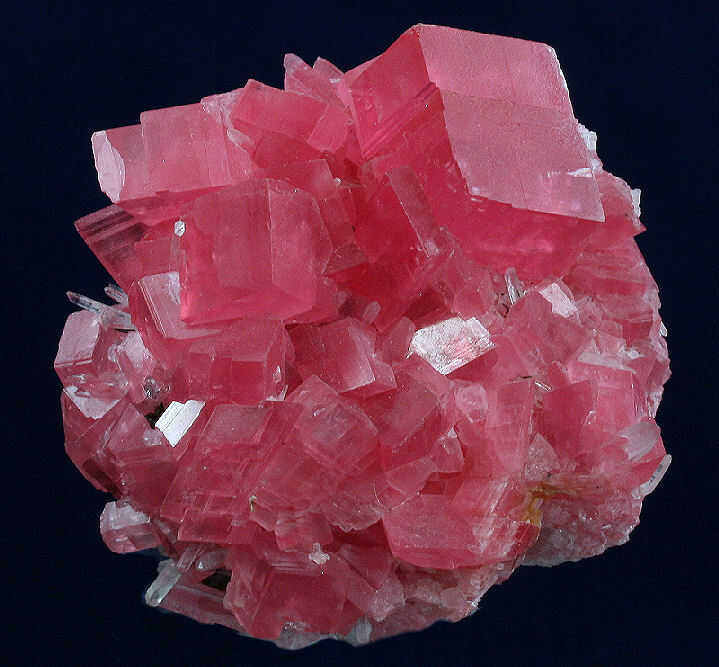 Also some minor pink Apatite crystals on the backside.